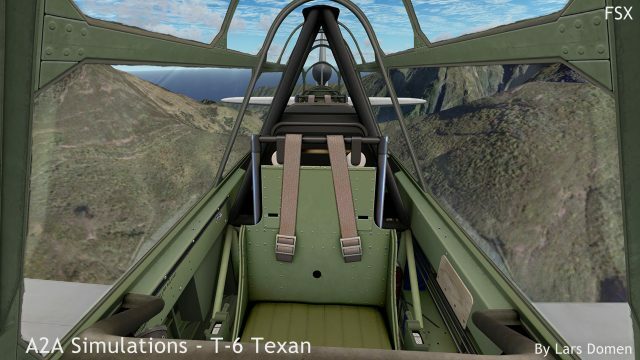 A2A Simulations became almost synonymous with gorgeously detailed WWII fighter aircraft (notwithstanding that they also did some exquisite models outside this category), before they switched focus and produced 4 highly acclaimed general aviation aircraft, 2 each from Cessna and Piper. 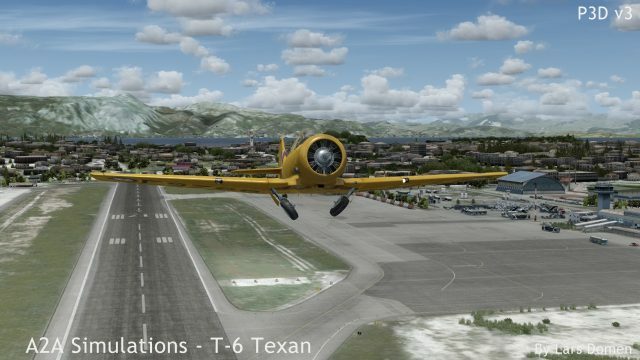 With the T-6, they go back to the WWII era, but a trainer aircraft this time. 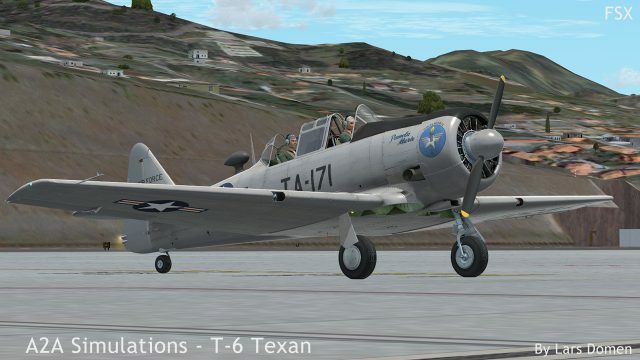 Indeed, I see a certain elegance in how the T-6 Texan fills the gap between the high performance warbirds A2A became known for, and the more accessible GA trainers they released the last couple of years. 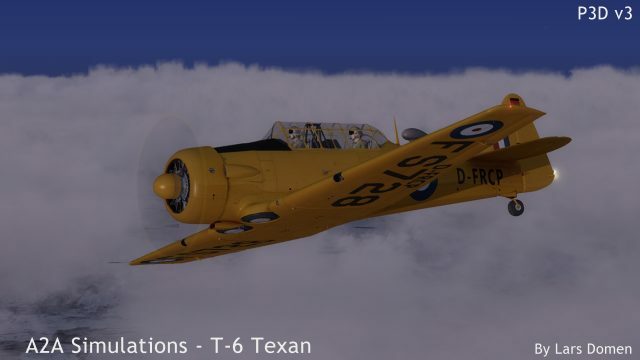 Now best knows using its post-1962 designation, the T-6 originally had several different names and designations, depending on the operator. 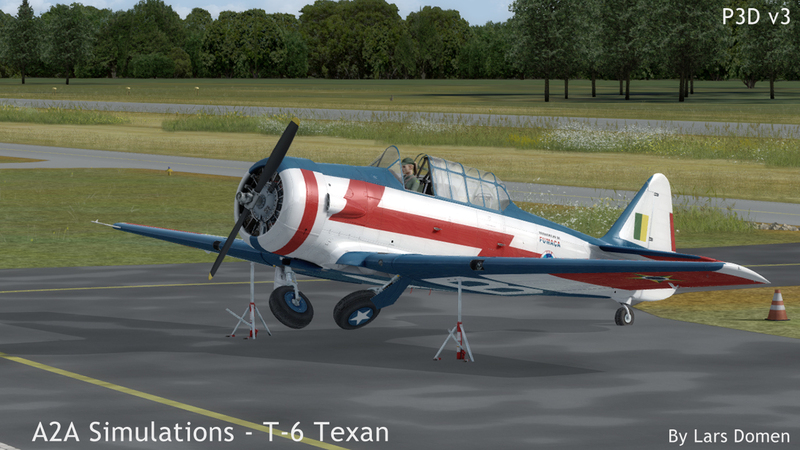 The USAAC/USAAF knew it as the AT-6, the US Navy as the SNJ and British Commonwealth forces knew it as the Harvard. It’s by that last name it’s probably best known outside of the USA. 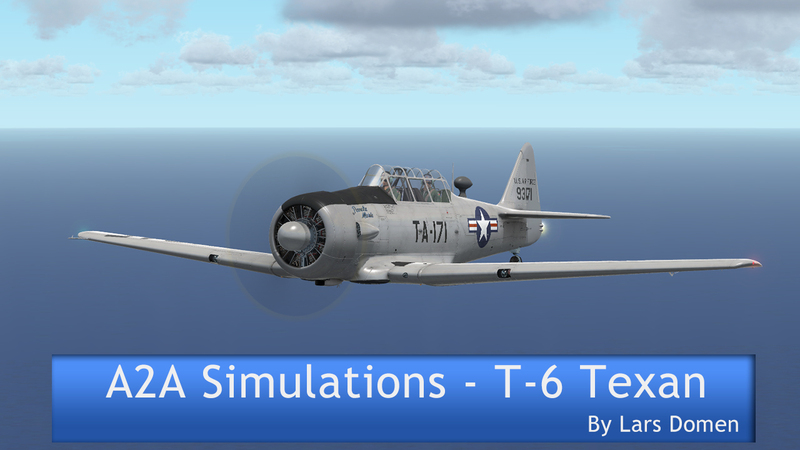 A2A Simulations products are always easy to install, and the T-6 is no different. It’s just a matter of downloading the installer and running it. 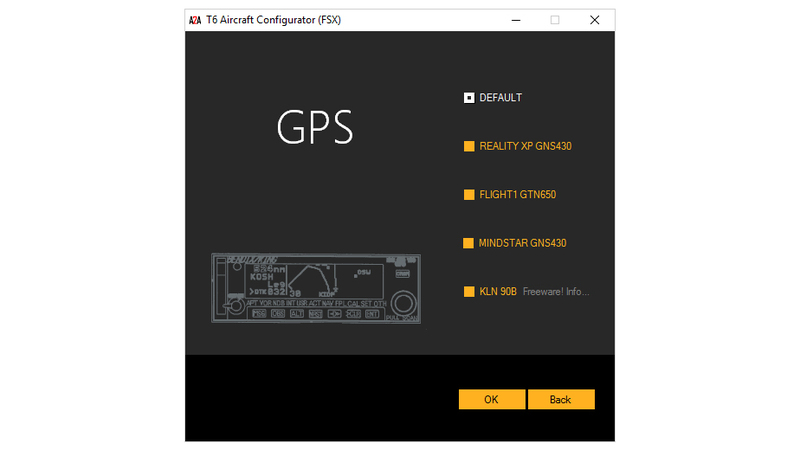 There’s a separate installer for FSX (277MB) and for P3D (308MB). Updates for the T-6 are integrated in the overall update downloads that are available from the A2A forums. Before you are able to download and install the product, you have to buy it first of course. It potentially gets a bit complicated here, as there are 5 versions available for purchase, depending on what simulator you use. 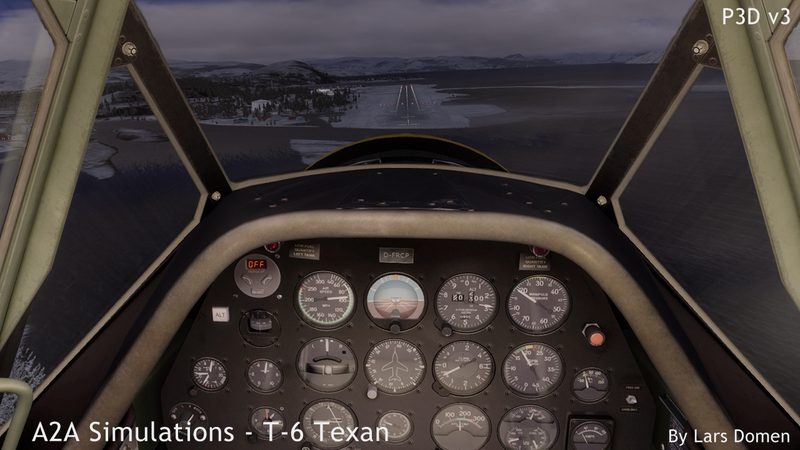 These are, in order of ascending prices, versions for: FSX; P3D Academic, P3D Professional; FSX + P3D Academic and FSX + P3D Professional. Prices range from €44,50 on the low end, to €89,55 on the other. While it’s of course their prerogative as a company, I’m not a fan of added prices for using the product in 2 simulators (FSX and P3D). It’s nice to have a bundle which is cheaper than buying the full product twice. 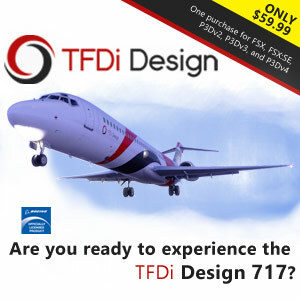 But many other companies allow installation in both FSX and P3D with a single purchase. It’s not like you would run both sims simultaneously anyway. 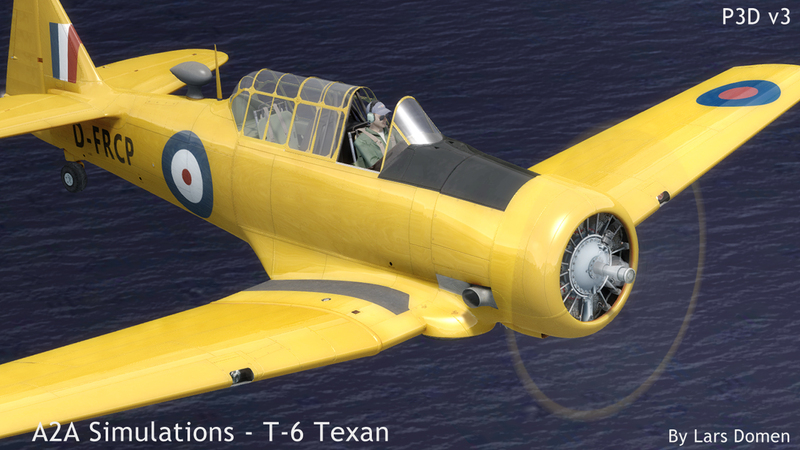 A2A has always been known for beautiful models, and the new Texan is no exception. Of course, the general layout is very well represented. A great looking general shape with very smooth curves. But there’s also a lot of small details to be seen, which are intricately recreated. Think things like lights, antennas and other small protrusions. The landing gear is also a classic part where a lot of detail can be found. 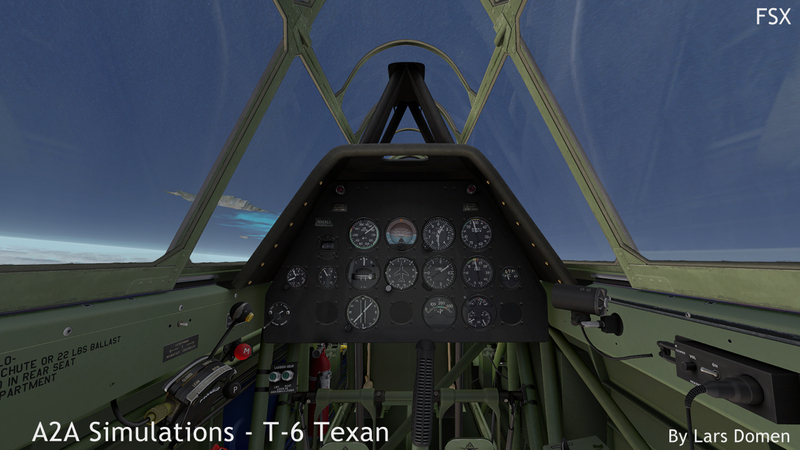 But on the T-6 the canopy, of which you get 3 versions, is also worth mentioning. And then there’s the engine and propeller hub, which are just gorgeous. The textures covering the models are again, as usual for A2A, of very high standard. Panel lines, rivets and other small details are there in the right proportions. They’re visible, but not too big and present at the same time. Just right. Same story with wear and dirt. Overall, the different liveries also show a very well balanced reflectivity. There’s one livery representing a polished metal aircraft, which is of course highly reflective. This livery is the perfect showcase for the amount of details A2A put into these liveries. The aircraft looks good at night as well. 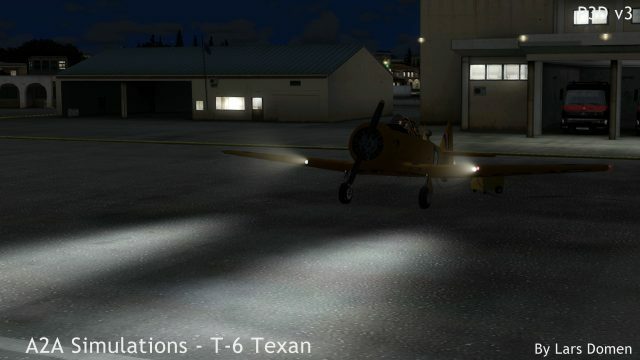 Using an external configurator you can choose between default FS landing lights, or the much better looking custom ones. 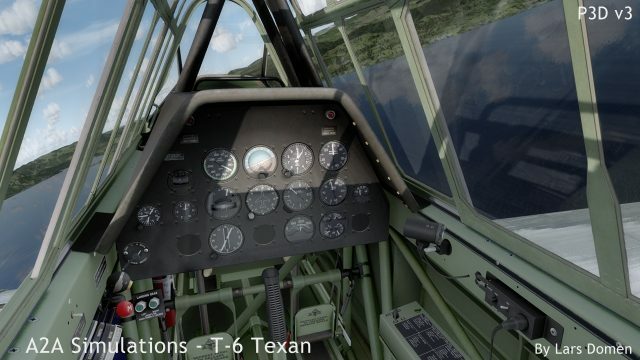 The reason for the choice, is that when A2A first tried the custom ones, there were people who had problems with clickspots disappearing in the VC. 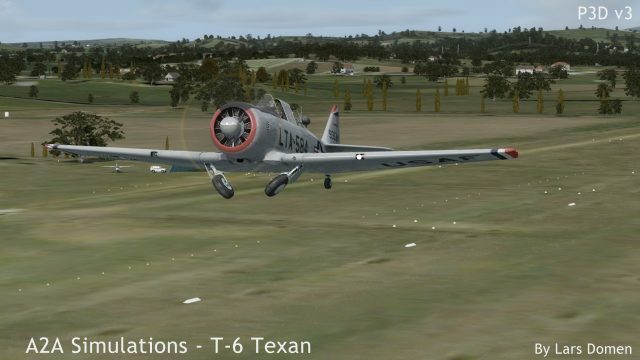 For me, the custom ones work perfectly on the T-6. And they look nothing short of amazing. All other lights are of similar high quality. And I’m quite fond of how the cockpit flood lights spill over onto the wings of the aircraft. The custom landing lights in all their glory. Also note the cockpit flood lights lighting up the wings. One final aspect to mention in this part of the review, are the effects. 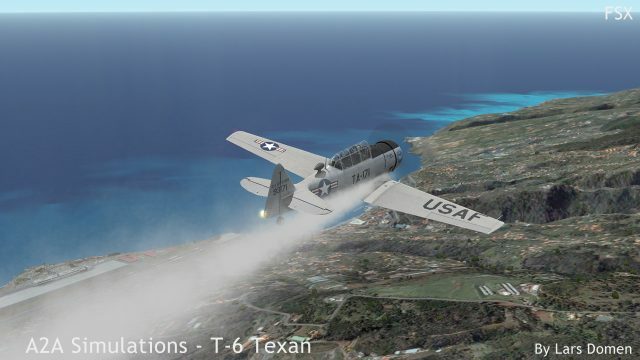 Like all Accusim aircraft, the T-6 has a lot of smoke effects in its inventory, which can be quite helpful in determining the engine’s health. In addition, there’s also an ‘airshow smoke’ system, which does quite a good job of having the smoke trail from the engine exhaust, not randomly behind the aircraft. Flying with a less-than-healthy engine. Drawing lines in the air. The smoke looks like it’s coming from the exhaust as it should. In the interior, the high visual standards are once again visible. Very good looking model, while maintaining high performance. It’s something that A2A has almost made into a trademark. The amount of details is stunning. Everything that can be modelled, is, or so it seems. The panel in the front cockpit. Looking very good. When looking at the texturing, it’s, unsurprisingly, of high quality. High resolution and efficiently used. However, I can’t shake the feeling that even more could’ve been done with it. The green painted metal, in particular, is surprisingly pristine. Even places which are likely to receive a lot of physical contact, show not a single sing of wear. 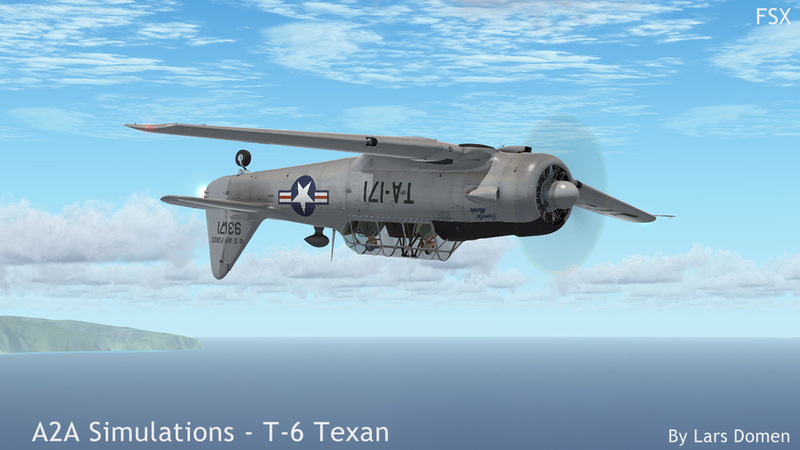 I don’t know how the airplane A2A based this on looks, but it surprised me, and just feels a bit unrealistic. Other items, like the main instrument panel and the control inputs show quite a lot of wear, making the pristine surfaces stand out. The panel for the instructor. Note that it has much less instrumentation. 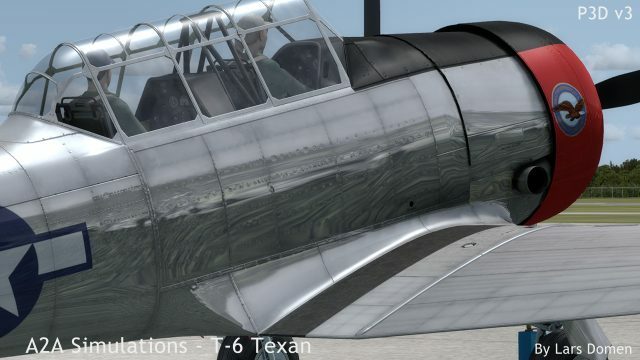 Not sure how real T-6’s look like here, but I would’ve like a bit more wear and tear. Nevertheless, it remains an outstandingly good looking cockpit, which also looks great at night. The night lighting is of the on/off-type, not dimmable, but looking great nonetheless. The VC after sunset with the floodlights on. 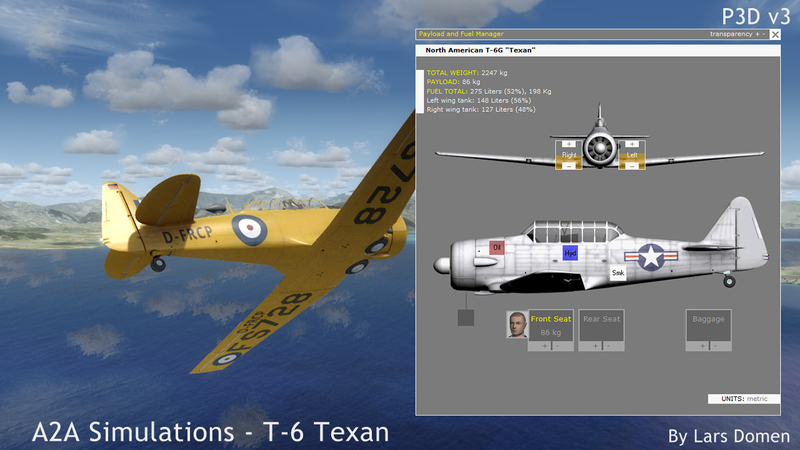 What should be noted is that the instrument layout is based on how a “warbird T-6” might be flying now. This means modern instrumentation in the modern layout, including modern radios and (optionally) a GPS unit. Whether this is good or bad depends entirely on your preference. Some people would’ve liked to see the instrumentation as it was around WWII, others are perfectly happy with this approach. One of several GPS options. Also note the Controls 2D Panel, with all it’s toggles and options. The flight dynamics of the Texan are an area where A2A spent a lot of effort on, and it shows. It’s a very pleasant aircraft to fly. It feels realistic in about everything I put it through. While it’s a trainer aircraft, it most certainly is no easy aircraft though. Although it’s got a pretty powerful engine, it’s also heavy. So don’t expect it to climb like a rocket. It just doesn’t. Conversely, the T-6 is quick to gain speed in a dive. 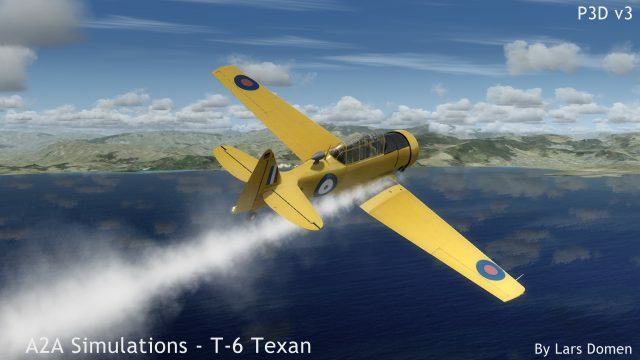 It’s fully capable of doing aerobatics, but you’ll have to plan ahead and keep your energy up. The T-6 can do aerobatics, including loops… If you do it right. Entry speed is key here. 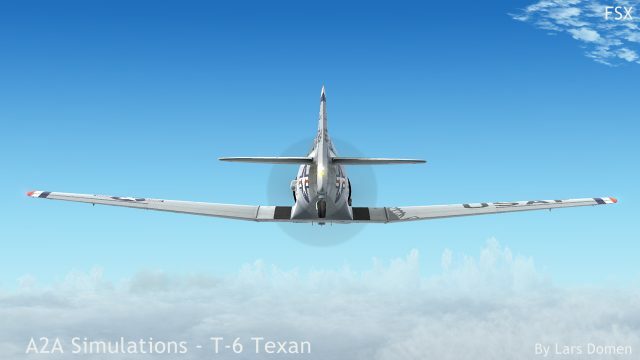 At high speeds, the Texan handles crisp and clean. At lower speeds, it becomes expectedly sluggish. 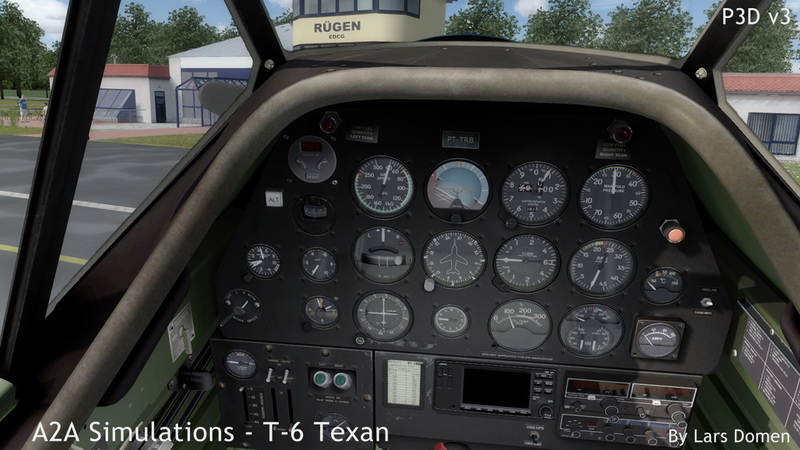 For an FSX/P3D aircraft, the stall is very good. Stalls feel very realistic and are perfectly repeatable. Recovery is predictable and easy if you offload the wings. 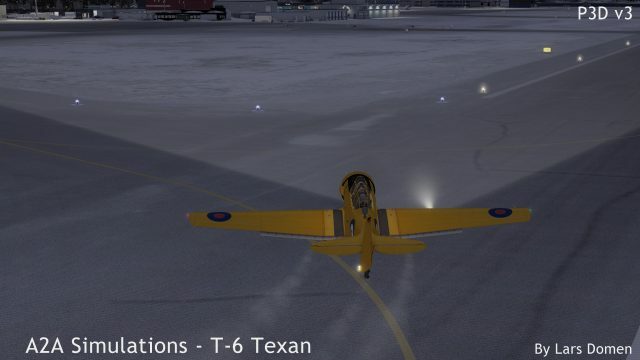 The Texan also has quite realistic spin characteristics. You’ll have to pull and keep it in a spin, but if you do, you’ll see those beautiful (well, from a certain point of view) characteristic spinning turns. Just centre all controls, and it’ll fly itself out nicely. 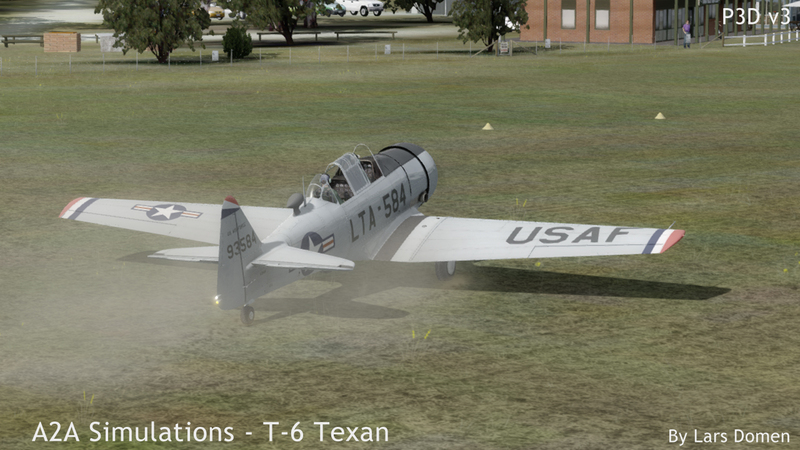 One aspect which makes the T-6 infamous is the danger of ground loops, inherent in just about any taildragger. When testing this add-on, I kept trying to force a groundloop unsuccessfully. Only to have one happen on me out of the blue a couple of flights later. Ego deflated, impression of the handling of this aircraft through the roof. 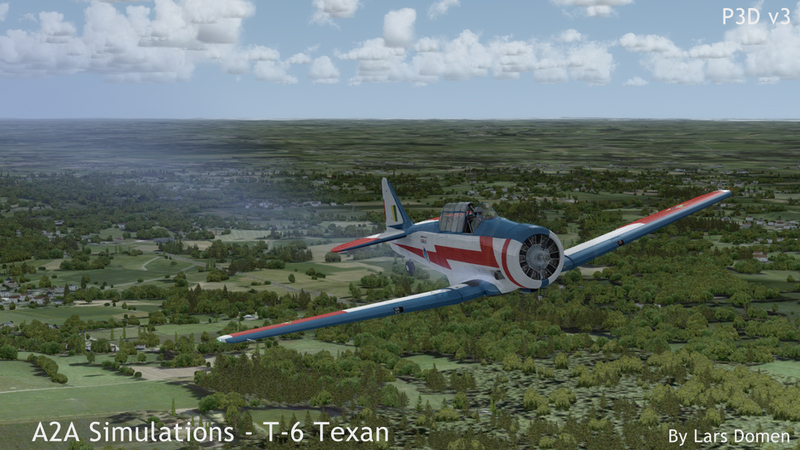 The T-6 is not the easiest to handle on the ground, but not the hardest either. 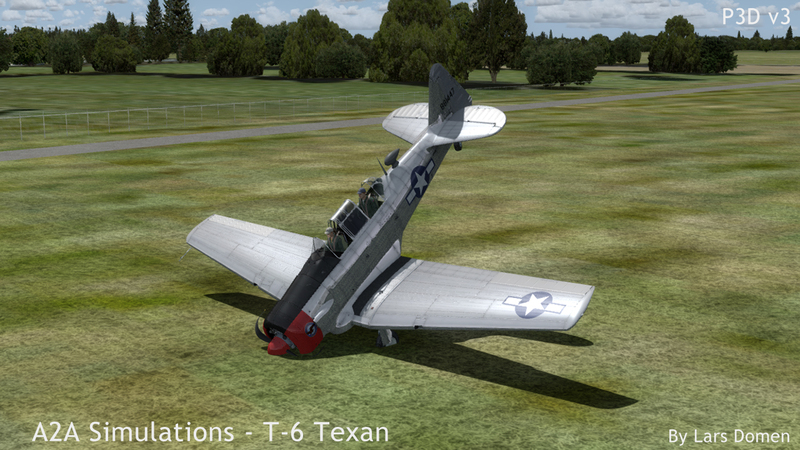 Just beware of ground loops when landing in crosswinds. Also note the ‘default’ option landing light in this shot. 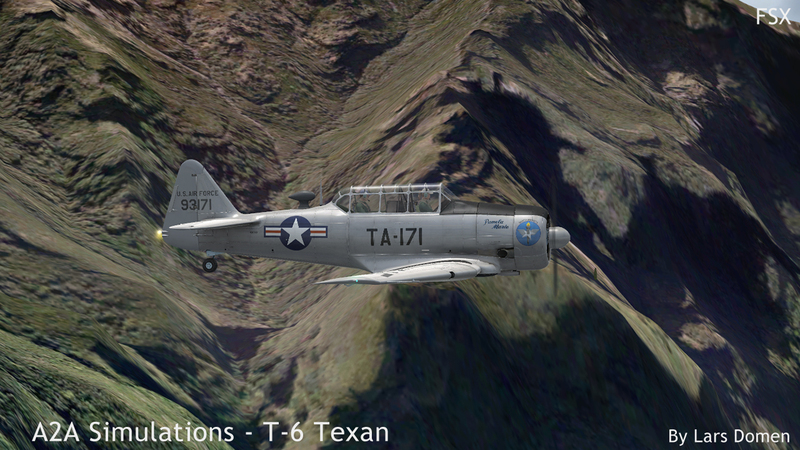 In short, a hugely rewarding aircraft to fly, but one that’ll kick you in the head when you least expect it. Getting the Texan up to altitude can be an exercise in patience. On the other hand, getting back down can go a lot faster. The North American T-6 Texan/Harvard is quite low on ‘systems’ as we know then in flightsim. A basic electrical system, a very basic hydraulic system, and not much more. This doesn’t mean they aren’t intricately covered in this A2A rendition. Even the circuit breakers work. 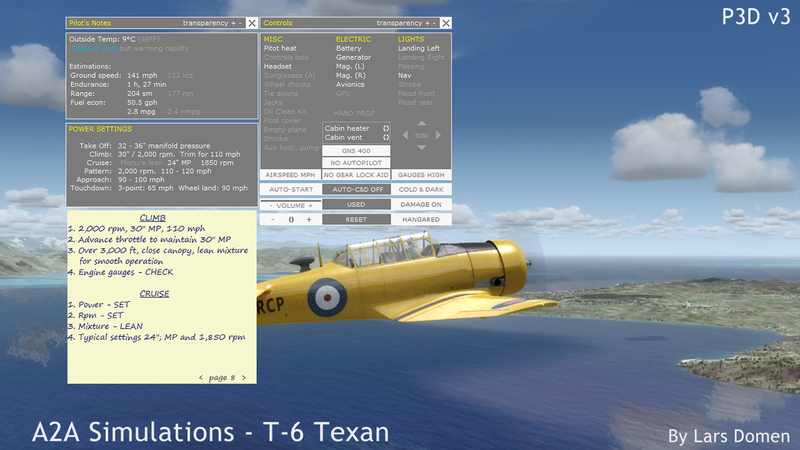 Optionally, you can load the A2A T-6 with an autopilot. But it’s a very basic one. Fits quite well in this plane though, and works perfectly as advertised, which means you’ll have to read the manual to use it. 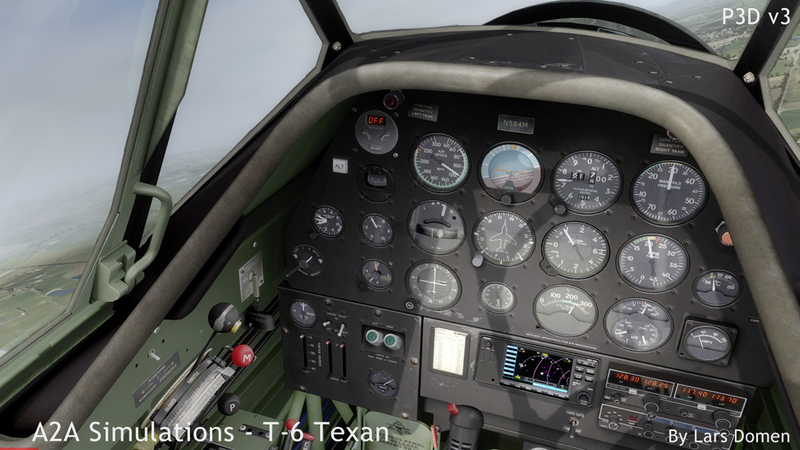 The autopilot is visible top left on the panel. I tended to fly with it installed, although seldom enabled. As you can see, functionality is very limited. In essence: maintain heading, turn left or turn right. A separate altitude hold is also available. Perhaps of more interest, are the A2A systems which make this aircraft, as A2A says, come to life. Of course, this means Accusim. The Accusim catchphrase, “A living, breathing aircraft” is very appropriate. I’m not even going to try and list what Accusim is capable of. I would not get it all right, and this review would be way too long. Let’s just say that it does an amazing job of getting you immersed in the aircraft. It’s a lot more than some pixels on a screen with 100% predictability. Most important is that everything can break, and nothing magically works. This means that starting the engine is a delicate exercise requiring all parameters to be just right. Especially in cold weather the T-6’s Pratt & Whitney Wasp can be quite unwilling to start. Once it’s started, it’ll also run realistically. It will stall if you idle too low, but it won’t immediately quit if you cut the fuel for a moment. It’ll run the lines dry, start running rough, and finally quit when it’s fuel deprived. Closely tied to the engine is the way the entire cockpit vibrates. Not new for A2A at all, but it remains nice to see. Especially visible at low rpm’s, and adding a lot to the immersion factor. A2A Simulations ships their usual assortment of 2D panels with the Texan. 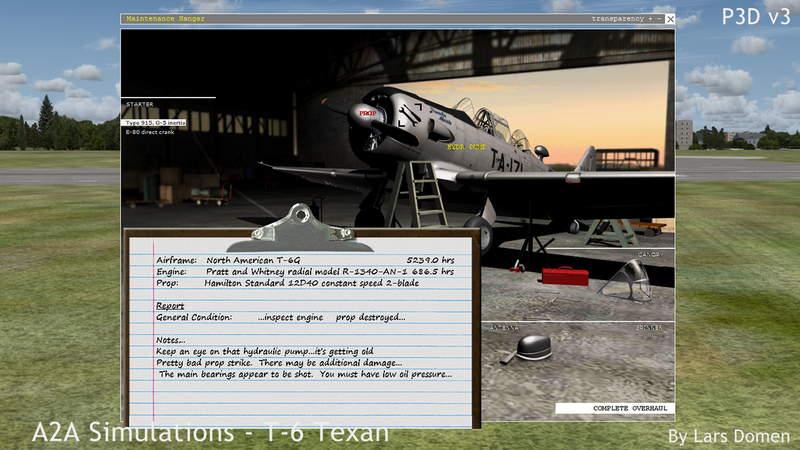 Pilot’s Notes, Controls, a loading panel, radios, moving map, and of course the all important maintenance hangar. 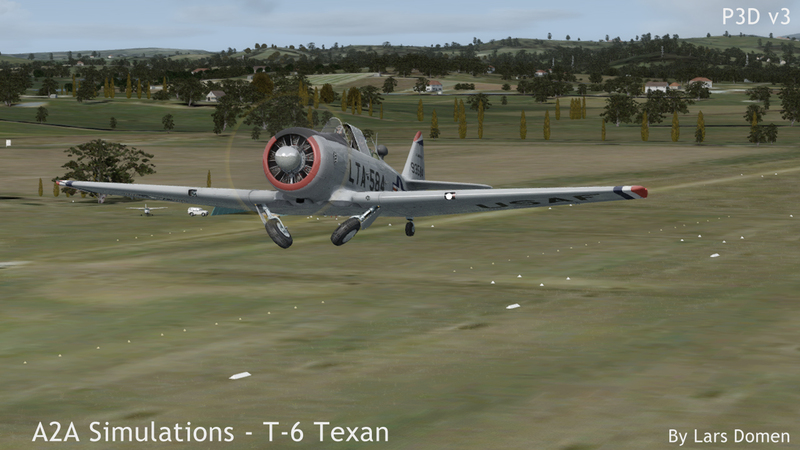 Unfortunately, the walkaround feature A2A introduced in their general aviation line hasn’t made it into the Texan. I know I’ve been quite short about the accusim features of this aircraft. The truth is, I could keep writing for ages about it, and still haven’t have said everything there could be said. So I’ll just summarize it like this: A2A’s Accusim gives you a very realistic aircraft in which actions have consequences and problems have causes. … and will warrant a visit to the maintenance hangar. Getting their aircraft to sound right, is something that A2A does like no other. 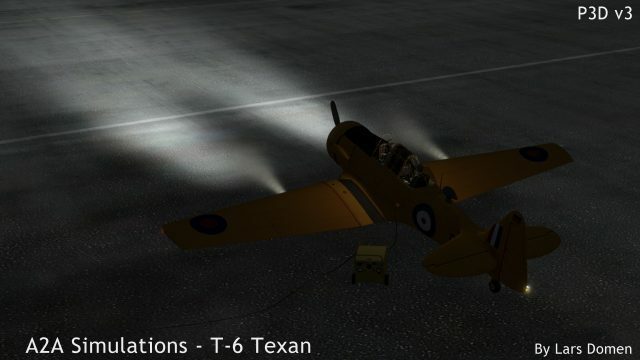 So no surprises in the Texan either. The sound are magnificent. From that 9 cylinder radial engine, over the different smaller noisemakers in the aircraft, down to the screech of the tires gripping the pavement. It’s all there, sounding great. Even the wind flowing over the aircraft is very well represented, with tone and loudness depending on airspeed, slip angle, whether you have the canopy open and so on. As usual with A2A Accusim products, the manual that comes with the T-6 is quite the read. At 128 pages and almost 70MB, it’s a big manual indeed. Again as usual, it has quite a bit on the real aircraft before diving into the simulator. The manual only starts covering the simulated aircraft at page 50. 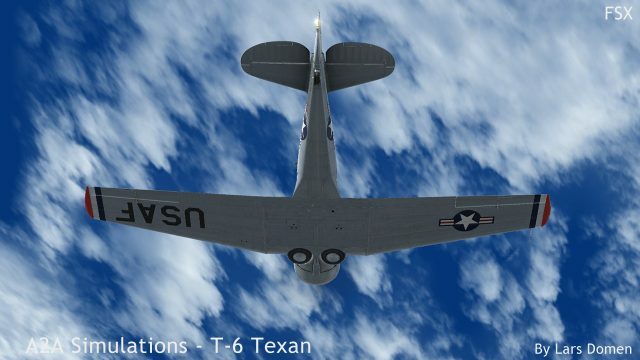 Everything till then is on the real world aircraft and its history. I found it very interesting, but not everyone will be interested in stuff like this. 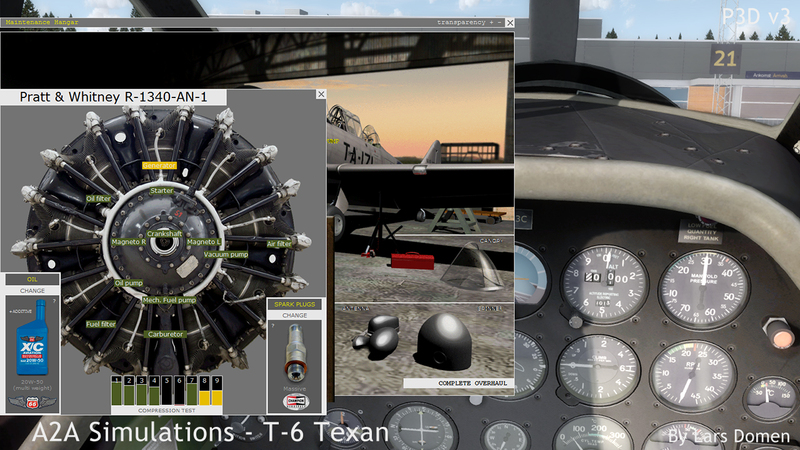 The simulator aspect of the manual is also very detailed and complete. It covers some basic physics and aerodynamic principles to get pilots to understand what happens in the aircraft. Some repetition from other A2A Accusim manuals, but quite insightful if you’ve never read it before. The manual also covers how to operate the simulated aircraft, the cockpit layout, normal and emergency checklists, procedures,… Very complete in all regards. The A2A T-6 also comes with 2 external utilities. First, there’s the Aircraft Configurator. It just has 2 functions: switching between custom and default landing lights, and switching between several 3rd party GPS units. 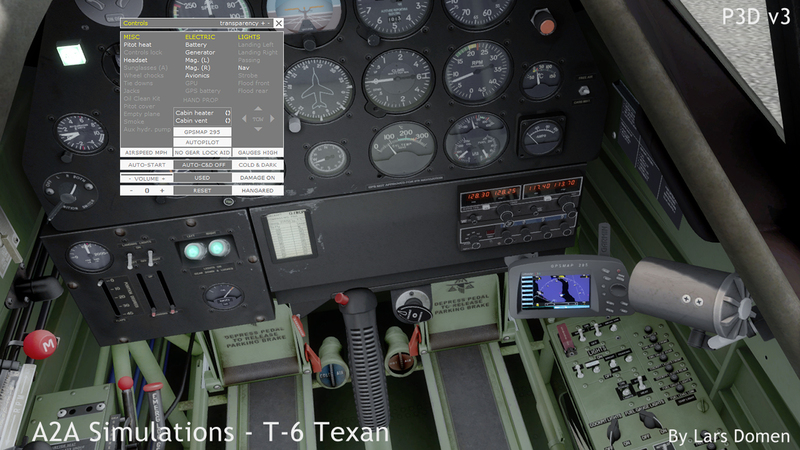 The possiblities are: default (FSX GPS), Reality XP GNS430, Flight1 GTN650, Mindstar GNS430 and freeware KLN 90B. Quite the choice, as you can see. 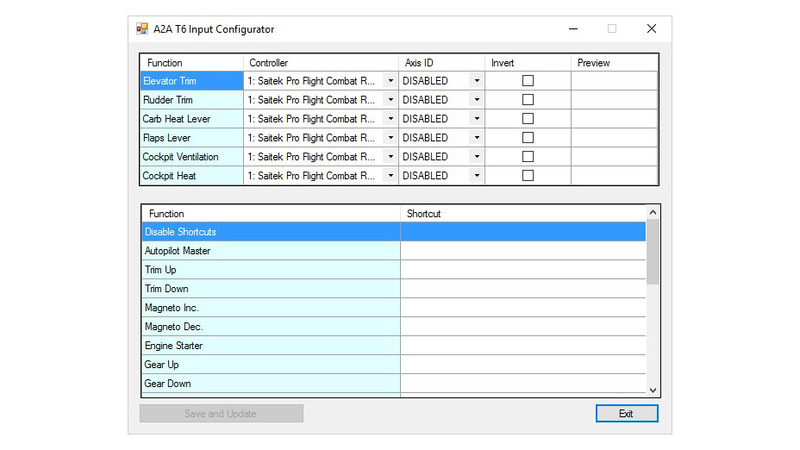 The second utility is the Input Configurator. 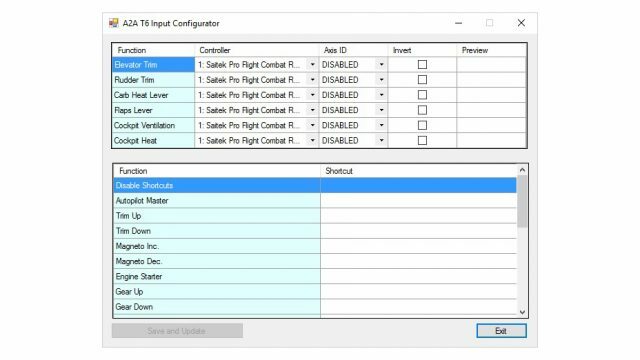 This allows you to assign axis or shortcuts to some controls which behave differently than what FSX/P3D expects by default. Think of stuff like an analog control axis for cockpit ventilation (which FSX doesn’t have) or separate gear up or down shortcuts where FSX uses a single shortcut to toggle the gear both up and down. 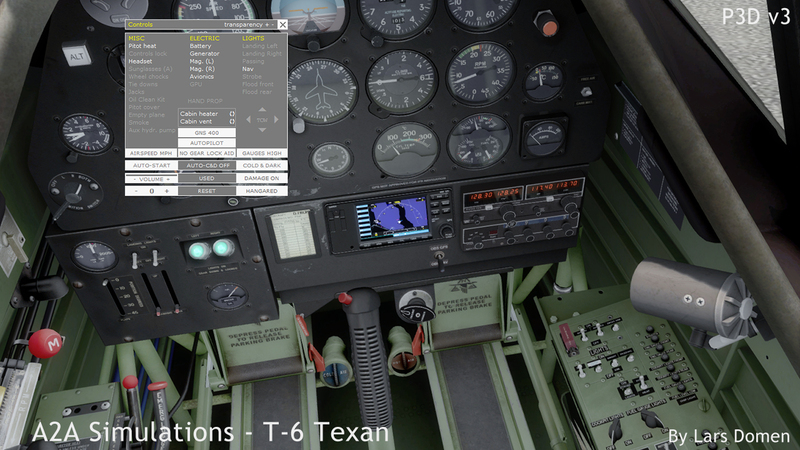 Personally, I’m not in the habit of using A2A’s Input Configurator. But it’s very nice to have, you can assign more realistic or more appropriate controls if you so desire. 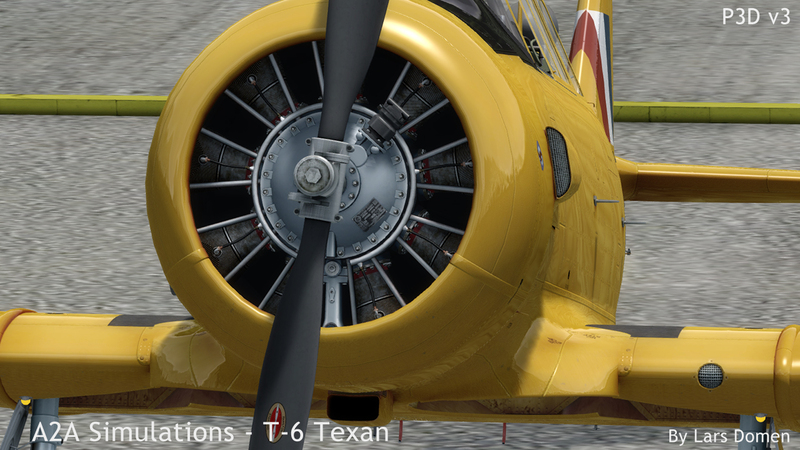 It’s quite safe to say that A2A’s return to the WWII era with the North American T-6 Texan is a success. 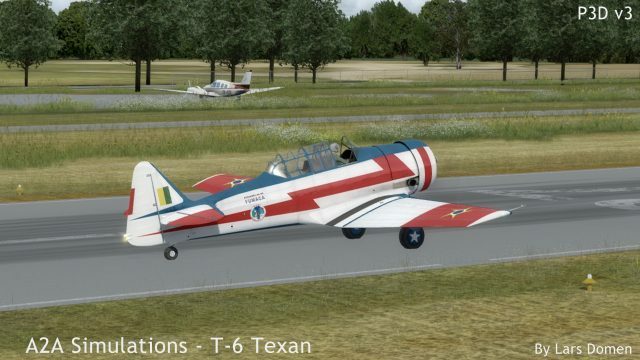 With beautiful visuals, great sounds and outstanding flight dynamics, the T-6 is another example of the consistent high quality which we expect from A2A. The ‘Accusim Treatment’ fits this old workhorse perfectly, and will result in hours and hours of enjoyment for those who buy it. Low and fast! Lots of fun! Missing the walkaround feature from A2A’s GA line.